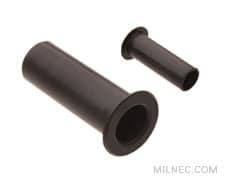 RSRB rubber bushings are designed to provide MIL-C-5015 reverse bayonet connectors with additional environmental sealing. In addition, they protect wire jackets from friction against strain relief clamps. Bushings of adjacent sizes are able to nest inside each other.